Robin Wallbridge, captain of the HMS Bounty, the replica ship that was built for the 1962 movie "Mutiny on the Bounty" with Marlon Brando, poses with the ship in Belfast in August 2012. PORTSMOUTH, Va. — The ship’s engineer was seasick and spitting up his medication. A deckhand had been tossed past the mainmast, breaking three ribs. The captain had been slammed against a cabin table, wrenching his back. He could barely walk. Capt. 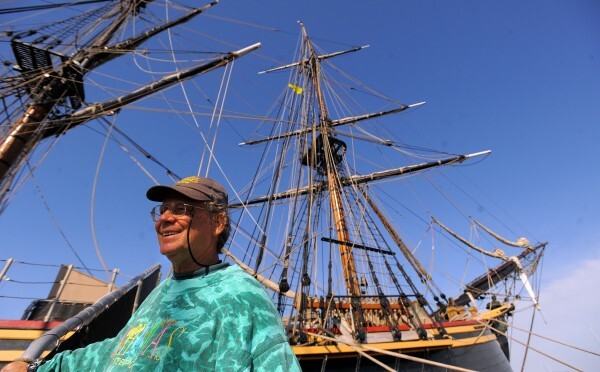 Robin Walbridge, sailing the tall ship Bounty from Connecticut to Florida, was trying to outflank Hurricane Sandy, which was roaring toward New York. But instead of slipping around the storm, the ship had crossed directly into Sandy’s path. It was after dark on Oct. 28, and the three-mast vessel pitched and rolled in the Atlantic 90 miles off Cape Hatteras, its 16 crew members fighting to keep the ship afloat. The 180-foot Bounty took on water through its leaky oak and fir planking faster than the failing bilge pumps could keep up. Fuel was leaking. The foresail was shredded. The port engine and generator were failing. The Bounty’s lights flickered in the gloom. The chief mate pleaded with the captain to make a distress call to the Coast Guard. No, Walbridge said, they just needed to get the generators cranking again. Sometime before dawn on Oct. 29, the Bounty pitched violently on its starboard side and the crew tumbled into the cold Atlantic. The Bounty, described as “a wooden sailing ship of primitive build,” was a leaky money pit for its owner, Robert Hansen. He formed HMS Bounty Organization, LLC to handle the ship’s affairs and had put it up for sale last year. Hansen invoked the 5th Amendment and did not testify. The ship was moored in New London, Conn., in October. Walbridge was eager to sail it to St. Petersburg, Fla., where it was scheduled to be on exhibit. A replica of an 18th century sailing ship, the Bounty was built in 1960 for the Marlon Brando film “Mutiny on the Bounty” and starred in two “Pirates of the Caribbean” movies. The Bounty wasn’t licensed to carry passengers at sea. Tourists paid $10 to visit the moored ship in ports in the U.S., including in Maine, and Europe. A shipyard manager testified that during an overhaul of the ship in Maine last September, workers found widespread rot in the frames and planking. But only two planks were replaced, and the rotting frames were simply covered with recaulked planks. Crew members declined requests for interviews, but their detailed and often emotional testimony described a beloved and dedicated captain so confident in his sailing abilities that he sent his compromised ship into a hurricane, convinced that he could outsmart any storm. As Sandy grew more dangerous, crew members received panicked phone calls from family and friends. Walbridge called his crew together and gave them a chance to go home. Everyone decided to stay. There was little talk of remaining in New London to ride out the storm, though Walbridge himself described Sandy as a “Frankenstorm.” Chief mate John Svendsen, 41, a Bounty veteran, told Walbridge that high seas and devastating winds were predicted; the captain said the Bounty would handle the hurricane just fine. Walbridge planned to get on the far southeastern sector of Sandy to take advantage of favorable winds, which would blow the Bounty safely away from the hurricane. He said ships in hurricanes were safer at sea than in port. Most of the Bounty’s crew were certified seamen, but six had virtually no sailing experience. The cook, Jessica Black, 34, an Aroostook County native, had signed on just a day earlier and the engineer, Christopher Barksdale, 56, had joined the month before. Barksdale had no professional engineering credentials. Walbridge, 63, wore a ponytail and hearing aid. He had skippered the Bounty for 17 years. People joked that he spent more time with the ship than with his wife. He loved teaching sailing and seafaring; he called his crew “future captains of America.” They considered him intelligent and intuitive; he was a skilled chess player and gifted mechanic who once repaired an onboard generator with microwave parts. Like many seamen, Walbridge was superstitious about leaving port on a Friday. He made sure the Bounty left New London late in the day on Thursday, Oct. 25, his birthday. The weather was beautiful that Friday — fair and clear. But by the end of the day, Sandy’s winds and waves buffeted the ship as the storm blew north. Walbridge plotted on a chart the Bounty’s position in relation to the gathering hurricane. Tracie Simonin, the sole full-time employee of the HMS Bounty Organization on Long Island, copied and pasted updates from the National Hurricane Center and emailed them to the crew every few hours. Walbridge was a stickler for safety drills, rigid deck watches and redundancy. The ship had two engines, four bilge pumps, four fuel tanks, plus an emergency hand-held gasoline pump. By late Friday, he was running both engines hard. The ship, which normally sailed at 4 to 5 knots, was speeding along at 14 knots. (A knot is 1.15 mph.) “Right now we don’t want to get between a hurricane and a hard spot,” Walbridge emailed the home office. Sandy was now 1,000 miles wide. On Saturday, the seas turned rougher, cresting 8 to 12 feet with winds at 25 knots. A generator sputtered and belched black smoke. In the engine room, the bilge pumps struggled. Adam Prokosh, 27, a seaman who’d spent eight months on the Bounty, noticed on the tracking system that no other ships were anywhere near. “It was pretty lonely out there,” he testified. The ship’s progress was updated on the Bounty’s Facebook page — by the father of a deckhand, who posted from his home in Illinois. “Rest assured the Bounty is safe,” he wrote. By Sunday morning, the storm was upon the ship. Seas surged to 25 feet. Winds blew up to 50 knots. The ship rocked and pitched. Claudene Christian, 42, had been an unpaid volunteer since May and became a $100-a-week deckhand on Oct. 18. A former Song Girl at USC, Christian was considered the most upbeat person on board. At midday, the winds blew out the foresail. Barksdale, the engineer, jammed his right hand as he was tossed about the deck, then gashed his arm in the engine room. The rough seas slammed Prokosh across the deck. He broke three ribs and crushed a vertebra; Christian tended to him in his bunk. Walbridge was thrown into a bolted table, wrenching his back. He was in agony. Below deck, the tank gauge ruptured, shutting down the port engine and generator. The lights went out. Matthew Sanders, the second mate, worked furiously and restarted the generator. But water kept pouring in. Around 4 p.m., Sanders and other crew members made a last-ditch effort to get the bilge pumps working. The water was 4 feet deep in the engine room, and rising fast. Around 5 p.m., Walbridge ordered the ship to “heave to,” essentially go dead in the water. The captain turned the bow into the pounding seas to avoid broadside hits. That ended all chances of the Bounty outrunning Sandy. Svendsen begged the captain to make a distress call to the Coast Guard and to Hansen, the owner. But Walbridge said there was still time to get the generators working properly and pump out the water. Three hours later, with Sanders reporting more water in the engine room, the captain relented. Svendsen fought his way to the weather deck and punched in numbers for the Coast Guard and Hansen. He screamed into a satellite phone against pounding wind, rain and waves. He couldn’t tell whether he was talking to an answering machine or a person. Hansen heard him and called Simonin at about 8:30. He told her to call the Coast Guard and relay the ship’s coordinates. By 11 p.m., a C-130 plane had taken off from North Carolina in search of the Bounty. Around 9 p.m., Sanders got the port generator running again, and the lights came back on. He was working in water up to his waist. Debris clogged the filters to one of the bilge pumps. Prokosh grabbed a colander from the galley and tried to strain out debris. The flooding triggered dangerous electric sparking and arcing. Seawater overwhelmed the starboard generator and it shorted out and died. The lights went out for good. Around midnight, the starboard engine died after it was flooded. The ship lost all propulsion. There was one final hope: The crew unpacked the ship’s hand-held, gasoline-driven emergency pump and hauled it up to the weather deck. It wouldn’t start. Someone found the instructions and, finally, the pump roared to life. But it wasn’t able to pump the water from below deck. The water in the engine room was chest-high now, rising at two feet an hour. Someone pulled out a hand-held anemometer, which registered winds at 90 knots before the device shattered in the storm. No one had an answer. Walbridge decided that the crew would prepare for the possibility of abandoning ship by getting into life vests and “Gumby suits,” the clumsy orange survival suits designed to keep people afloat. Two inflatable life rafts were readied. Walbridge assured the crew they would be fine until dawn, when Coast Guard rescue helicopters were due. The ship had communicated by radio with the Coast Guard plane, which had located the Bounty. As the crew helped one another into the survival suits, chief mate Svendsen tried twice to convince the captain to make the call to abandon ship. Walbridge refused. Sometime before 4 a.m., with the ship listing at a 45-degree angle, he changed his mind. Crew members crawled on their hands and knees, trying to assemble on the weather deck, as water raged across the boards. They carried waterproof “ditch bags” filled with passports, cash and cellphones. They clipped water bottles and bags of emergency provisions to harnesses on their life vests. They tied onto a line to keep from being washed overboard. They wore headlamps to see in the blackness. Christian tied together extra life jackets to toss into the water to create an orange marker for the helicopter pilots. She helped the injured Prokosh toward the life rafts. The crew did a head count. Suddenly, chief mate Svendsen yelled that the bow was under water. “We gotta go!” the captain hollered. Moments later, the Bounty was struck by a massive wave. The ship heaved abruptly starboard, dumping most of the crew into the Atlantic. Others jumped in as the ship began to slip under the waves. Svendsen clung to the ship’s mast as the Bounty rolled over. Then he tumbled into the ocean, breaking his hand and dislocating his shoulder. For more than an hour, everyone struggled to stay afloat in the surging seas. Some others also had broken bones and bloody gashes from being struck by debris or rigging. Six crew members held on to a plank of wood and reached an orange life raft. A second group made its way to another raft. Svendsen fought the waves on his own for three hours. No one could grab anything through the thick hand coverings on the Gumby suits. Everyone was weighed down by water that pooled in the feet of the suits. It took nearly an hour for the crew to climb, or be hauled, into the rafts. There, they sang sea ditties to pass the time. Just after dawn, two Coast Guard helicopters dropped swimmers into the water to rescue them. A video shows 14 crew members being hoisted into the helicopters. Walbridge and Christian were missing. Christian was last seen by the third mate as he held her hand on deck and passed her to another crewman just before the ship rolled. He remembered that she was calm and smiling. The Coast Guard found Christian’s body later that day, about a mile from where the ship went down. Her first paycheck had not been cashed. For the crew, the final memory of their captain was of a man bent over in terrible pain, his glasses askew, making a final check on everyone before half-walking, half-crawling toward the life rafts as the waves washed over the sinking deck.